As there are billions of smart-devices utilizing touch screens within the world today, Individuals with disabilities could be deprived from enjoying the convenience of such technology. For some, the mere ability to touch and swipe the display may be a daunting task at best. Thanks to Obed Ben Dov whom graduated from the Technion, the Israel Institute of Technology, those challenges may be overcome due to his vision of Sesame Enable technology. Those unable to utilize smartphones and tablets because of physical constraints may soon be able to enjoy those products. Head Movement – The technology is based around facial recognition. Much like eye scanning, the unit can essentially “sense” which direction your head is moving allowing you to control the mobile device. A cursor on the screen will allow you to select the controls you want to utilize. Leaving your head in one position will prompt the cursor to commit or cancel the selection. Currently, a version of this technology is available for Android devices on Google Play as an eReader or the VirtualSheetMusic app. Hand Movement – For those that are capable of using hand gestures, the application can allow a person to move their hands back and forth to flip through pages or scroll up and down. Combined, this means that an individual whether disabled or not can read eBooks without actually touching the display of the device. This can have great potential if someone is unable to become hands free while reading or is otherwise unable to touch the screen. Entertainment – The technology isn’t merely isolated to simple eReading. Games and entertainment can also become a factor for people with disabilities as development continues. Games such as Candy Crush can be played using nothing more than the movement of your head. This has potential in order to allow people with disabilities to enjoy some of the games and other venues that many people take for granted. Technology develops at a rapid pace to bring efficiency and functionality to human life. Accommodating people with disabilities is more difficult than it is for those unrestricted by physical attributes. More care and consideration goes into development in order to provide a platform that is usable for people with disabilities. However, developments such as the Sesame technology can open a variety of doors for everyone. Over time, Obed Ben Dov and his team hope to integrate the technology in a variety of other apps. Educational – Children with physical disabilities can enjoy educational games and materials from simple movement of the head or hands. As many schools are deploying tablets for educational purposes, this could be greatly beneficial to those facilities that accommodate children with disabilities. Social Development – Some children are unable to express themselves due to various complications with speech. Could this technology help those individuals by providing a method in which to communicate clearly with teachers, family, and friends? Entertaining Books – Those unable to physically interact with the mobile device can still enjoy a good book regardless of age. By simply moving the head about, virtually anyone can read hands free. 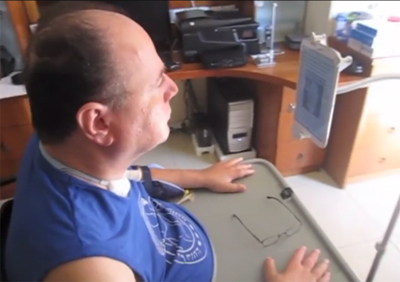 Assisting People Without Disabilities – The prospect of benefiting from an eBook while hands free can help in a variety of situations. This could include cooking, working on automobiles or even the computer repair industry. With each passing innovative development, human life becomes more interconnected and efficient. Although there are many that believe that the advancement of technology is creating a greater independence and laziness within society, there is much to be gained by pushing forward. It makes you wonder what will be developed tomorrow to improve life for people with disabilities. What assistive technology device benefits you the most?